Learning how to swim is an important part of life for everyone. 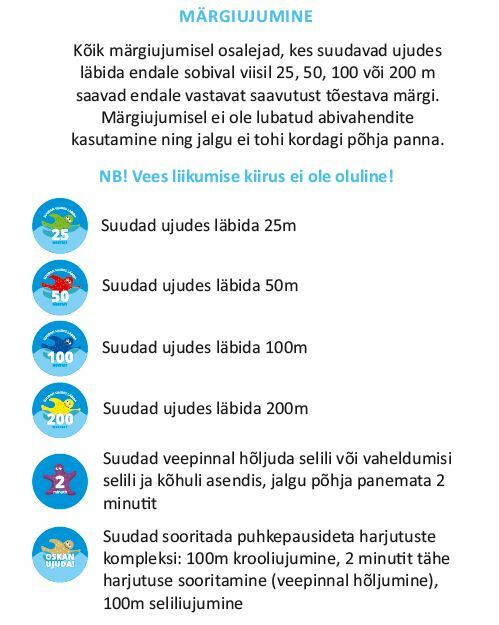 In order for ever more people to learn how to handle water, the Rescue Board, Estonian Swimming Federation and Estonian Lifeguards’ union started a focused cooperation program. The greater goal is the creation and implementation of an unified standard of swimming skills and the preparation of a basic swimming course for the national curriculum. The joint goal of the parties is to improve the swimming skills of the Estonian people and therefore reduce the number of fatal accidents. The ministry of Culture led a survey among public school swimming instructors in 2014 that made clear that the instructors need training in teaching basic swimming and also methodical materials. To improve the situation, the Rescue Board, The Estonian Swimming Federation and Estonian Lifeguards’ union organize courses for teaching basic swimming from 2015. The courses follow the methods of the basic swimming course book “Let’s learn how to swim”. The book itself is translated from Norwegian, compiled in collaboration with the Norwegian Swimming Federation and contains the best practices of swimming instructions around the world. Every participant may keep a copy of the book after the course to remember the excellent tips long after the course is completed. The book can be successfully used as a methodical aid in the basic swimming lessons of both kindergartens and schools. The courses are conducted by experienced swimming instructors with specific training from the Estonian and Norwegian Swimming Federations. The two-day course has a lot of emphasis on practical exercises which give the necessary skills and knowledge to conduct basic swimming courses. The course introduces the swimming instructors to the motivating badge system of swimming, originating in Norway, which can be used to encourage children to improve their swimming skills. The badges correspond to different skill levels and have different designs to motivate children to aspire to a higher level of swimming skill.